Kristen Stewart is featured in a music video from Jenny Lewis’ new album Voyager. The song is called “Just One of the Guys” and features Kristen along with Ann Hathaway, and Brie Larson as back up singers and musicians who sometimes dress as guys. There is a full fashion spread to go along with the interview. Read the whole interview at USA Today. We know we are late getting this posted, but if you haven’t yet seen it, here is the clip of Kristen chatting with Jon Stewart. On Monday Dec. 10, Kristen Stewart will appear on the Tavis Smiley snow on PBS. Check local listings for when the show airs. Here is a clip of the interview where Kristen discusses what it’s like being surrounded by so much media attention. Ok, so they aren’t actually talking to Ryan Seacrest, but it was in his booth. They are actually talking with Ariana Grande. 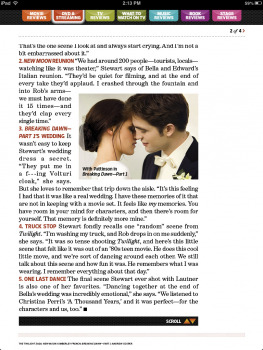 When I find Rob’s interview, I will get it posted. Kristen Stewart, Robert Pattinson, and Taylor Lautner Talk Breaking Dawn With On The Red Carpet. 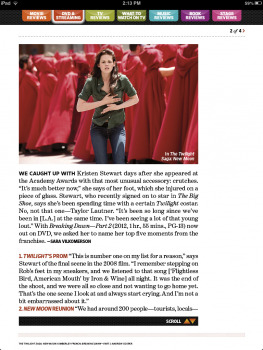 In a really great, and rare, interview with the LA Times Kristen Stewart and Stephenie Meyer discuss Twilight, the media frenzy, and what’s next. Read the rest here on the LA Times.